Security Expert Centre » Research Dossier → Why do we need 3-D printed and cloned organs? Research Dossier → Why do we need 3-D printed and cloned organs? Literature review of the existing practice of regulation of organ transplantation demonstrates a lot of controversial points such as: ethical problems of using xenotransplantation as the alternative way of receiving organs; practical and commercial issues of using stem cells for treatment of diseases; gaps in legislation concerning donation and transplantation. Despite the fact that organ transplantation sometimes is the only means of saving a person’s life, the operation in itself includes many risks. However, in many countries the main problem is the shortage of donor organs. For instance, in Ukraine annually some two thousand people are in need of a heart transplant, but not a single person gets it. A kidney transplant is needed by four thousand people per year. In reality, it is only received by 80, maximum of 100 people. Approximately 2 - 2.5 thousand persons per year need a new liver but only some 30 to 40 people get it. Due to the fact, that countries all over the world are experiencing an acute shortage of organs for transplantation and donation, new ways of solving such problems appear. One of the alternative ways of receiving of organs – using of artificial organs – is not regulated on the needed basis at all. This is reflected only in medical literature, without legal regulation. 3D printed organs are used as teaching tools for future surgeons to hone their skills before the collision with real emergencies in life. Quite interesting is that this "printing" is conducted by using live cells that have special form, can grow and develop and to be turned into a tissue or organ. 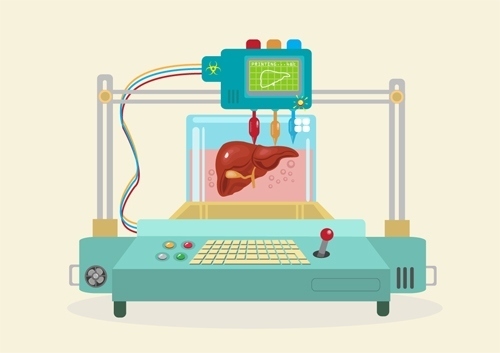 However, all researches unanimously state that using the method of 3D printing in the future will become a reality to overcome the acute shortage of donor organs for transplantation. Existing literature about the cloning shows a completely negative attitude to the possibility of its using as an alternative way of receiving of organs for transplantation. The most problematic are problems of cloning and legal regulation of the possibility to use cloned organs. Cloning can be defined as the process of creating identical copies (replication) organisms or other objects. In the understanding of medicine, cloning can be divided into two main categories – reproductive and therapeutic. On the international level reproductive cloning is totally prohibited, but among the countries there is no common opinion on the prohibition of cloning. Sandul I. (2011) “Organ transplantation in Ukraine - dead deadlock”. 05th of April 2011. [Electronic].